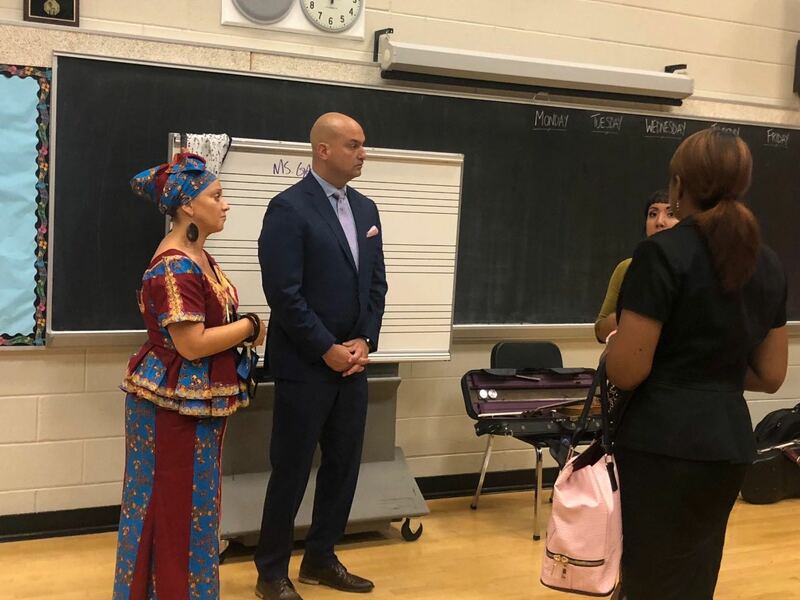 DPSCD Superintendent Dr. Nikolai Vitti visited several DPCSD schools, including Detroit School of Arts, to address the drinking water shutoffs in the district. The first day of school in the Detroit Public School Community District (DPSCD) was Tuesday, September 4, and students districtwide (106 schools) did not have drinking water. Last week, DPSCD Superintendent Dr. Nikolai Vitti announced the shutoff of all drinking fountains after the most recent round of testing discovered 16 out of 24 schools had elevated levels of lead and/or copper. Upon learning of the water contamination Dr. Vitti immediately made the call to turn off the the water at the affected schools and provided water coolers to every school in the district over the weekend. Dr. Vitti made the right call and had every right to be cautious as lead is a neurotoxin that can damage child brain development, cause behavioral problems, and sicken adults. Copper can cause gastrointestinal distress and long-term exposure can damage the liver or kidneys. Dr. Vitti and DPSCD staff began the first day of school inviting the community to help students rise after a summer of new curriculum professional development, leadership training, and the launch of a new branding campaign, which reflects the District’s strategic plan, Blueprint 2020. His goal was to bring attention to fresh, new lesson plans for K-8 students, new SAT prep courses for high schoolers, welcoming back art and music programming at each DPSCD school, and the launch of a newly formed elementary and middle school athletics program. But Vitti could not escape the elephant in the room: the water shutoffs. Cooled water coolers have been provided for every DPSCD school due to the drinking water shutoffs. At Detroit School of Arts (DSA), Vitti and school board member Angelique Peterson-Mayberry visited first-year principal Mayowa Reynolds to discuss the water fountain shutoffs and the district’s plan to fix the problem. Cooled Absopure water coolers were visible near every shutoff water fountain in the school and the district wanted parents to know that they did not have to provide their own water if they did not want to. Vitti said the cost of the coolers and bottled water will be $200,000 over two months, while his team develops a potential long-term plan for new central water stations at every school with independent piping systems. Vitti insisted that water in the school was safe for hand-washing, toilet use, and showering. He visited two other schools Tuesday morning before his stop at DSA and said parents that he talked to support and trust his decision. That seemed to be the mood among DSA parents as well. Elevated levels of lead and copper were found in 19 DPSCD schools in 2016. The 2016 testing came as a response to the Flint water crisis, in which more than 100,000 residents were exposed to lead-tainted water. The city of Detroit is also requiring city charter schools to participate in the same level of water testing as the DPSCD, after Vitti notified Mayor Mike Duggan of his decision. A large number of charter schools are utilizing old DPSCD buildings. “The mayor’s office plans to partner with us to determine challenges with water quality in our schools and solutions to them,” said Vitti. “His team is supportive of the decision. The drinking water fountains at all 106 DPSCD have been but off. Since Detroit Public Schools (DPS) transferred over to DPSCD, the new district cannot collect any new debt, which means they cannot borrow any money. During the transition, DPSCD was only given $25 million and most of that has already been spent on new roofs, according to Vitti. Costs to fix the infrastructure in DPSCD were estimated to be as high as $500 million. The district does not have the money needed to fix its water problem and Vitti said he hopes the new governor values and supports education in DPSCD and creates legislation that will allow the district to borrow or create new revenue streams to tackle the issue. Vitti said his team will post all water test results on the district’s website. In addition, they will send letters home to all students regarding the decision when the school year begins and utilize an automated call system to inform parents now. The district will also conduct engagement sessions districtwide regarding the decision once school begins.